BEIJING (Reuters) - Facebook's co-founder and CEO Mark Zuckerberg met China's propaganda tsar Liu Yunshan in Beijing on Saturday as part of a charm offensive in one of the few markets where the social network cannot be accessed. The rare meeting, reported by China's state news agency Xinhua, suggests warming relations between Facebook and the Chinese government, even as Beijing steps up censorship of and control over the Internet. Liu, who sits on the Communist Party's Politburo Standing Committee which is the apex of power in China, praised Facebook's technology and management methods, Xinhua said. 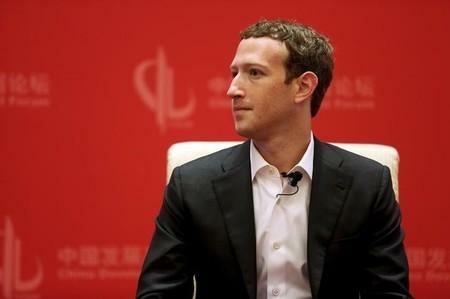 Zuckerberg was in Beijing for the China Development Forum, a government-sponsored conference bringing together top business executives and the country's ruling elite. China "hopes (Facebook) can strengthen exchanges, share experiences and improve mutual understanding with China's Internet companies", Xinhua quoted Liu as telling Zuckerberg. Earlier this year, Beijing introduced new rules on online publication, which analysts say may place further curbs on foreign internet businesses trying to operate in China. Online content publishers should "promote core socialist values" and spread ideas, morals and knowledge that improve the quality of the nation and promote economic development. Foreign companies in China, especially in media, face political pressure from a range of regulations. The country's military newspaper calls the Internet the most important front in an ideological battle against "Western anti-China forces". China, the world's second largest economy, has the biggest Internet population, numbering almost 700 million people. On Friday, Zuckerberg posted an image of himself running through smog in Beijing's Tiananmen Square, past the portrait of the late Chairman Mao Zedong hanging over the Forbidden City. The 31-year-old has achieved celebrity status in China, one of the few markets where Facebook and other foreign Internet platforms, including Alphabet Inc's Google services and Twitter Inc, are not available due to tight government controls. He has long sought to improve his company's relationship with the Chinese authorities, and now sits on the advisory board of the School of Economics and Management at China's elite Tsinghua University. Zuckerberg began his remarks to the forum in Mandarin, speaking about the promise of artificial intelligence, particularly devices such as self-driving cars and medical diagnostics. He sidestepped sensitive issues, talking instead about technology and his family. "The one thing I am extremely optimistic about for China is the emphasis on engineering," Zuckerberg said. He did not respond to a question from Reuters about Facebook's plans to do business in China. 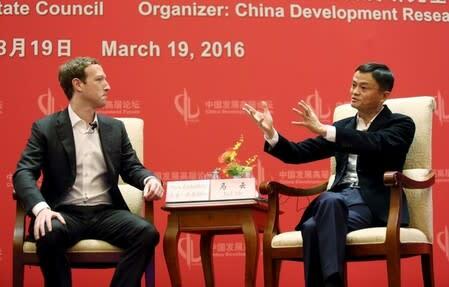 During the forum, Alibaba Group Holdings's Executive Chairman Jack Ma praised Zuckerberg, saying he respected Chinese culture and ran a "great company". "He respects the Chinese and Oriental culture by instinct," Ma said. "Not because he wants to make money."